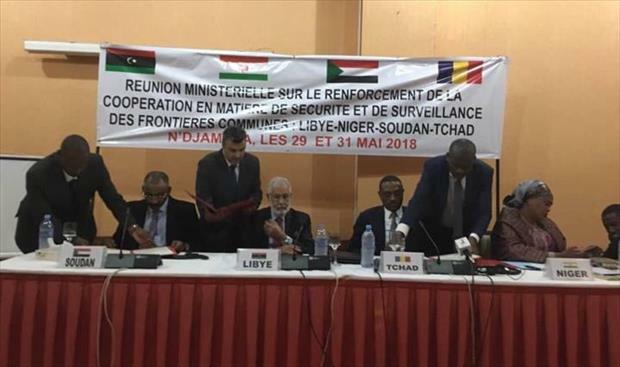 The Foreign Minister for the Libyan Government of National Accord, Mohamed Taher Siala, said an agreement to control and monitor borders among Libya, Sudan, Chad and Niger has been signed in Ndjamena. In a statement issued on Friday, Siala said the agreement was reached to promote cooperation, to protect the joint borders and in order to achieve peace, security, economic and social development. He said the agreement would enhance joint efforts of the four countries to secure the borders, stressing Libya’s keenness to support all efforts to fight against terrorism, illegal migration, human trafficking and all forms of cross-border crime. In a meeting held last April, Sudan, Chad, Libya and Niger agreed to “coordinate the actions” of their armed forces to fight against the transnational “crime” in the region. The four countries agreed “on the establishment of a cooperation mechanism for border security and the fight against transnational organized crime”. Al-Qaeda in the Maghreb and Boko Haram pose a serious threat to Niger and Chad while Sudan seeks to prevent trafficking of arms to Darfur and migration of mercenaries to Libya. Sudan is not part of the multi-national military force in Africa’s Sahel region dubbed “#G5_Sahel force” which includes Chad, Niger, Mali, Burkina Faso and Mauritania. The UN-backed force is tasked with policing the Sahel region in collaboration with 4,000 French troops deployed there since intervening in 2013 to fight an insurgency in northern Mali.